Haven’t stopped laughin’ hyar. Thet is one right fine site. Figgerin’ of yo’ an’ thet unpredickable English weather fo’ th’ trimenjus birthday bash t’morry. Make sho’nuff yo’ wo’d up th’ official photographer t’take plenty of photos of yo’ an’ Harry t’mark th’ day. Eff’n yer still wo’ried about how yo’ look in them ax th’ official photographer t’make sho’nuff they take yo’ in close-up. Tell them yo’ doesn’t be hankerin’ t’see enny distrackin’ backgroun’s. You do know it is utterly traditional and therefore IMPORTANT to the British soul to have garden parties in the rain? It’s, it’s like tea made in a tea-pot, and watching your brother play cricket while drinking luke-warm Pimms out of a plastic cup, and like being one of the secret society whose school fed them curry with raisins in, and like actually enjoying good long muddy walks. You are, by your very actions, upholding this island’s centuries-long tradition of bloody well enjoying being just a little bit dismal. So chin up, my dear. Also, your mother tidying up the bit you’ve just tidied – do they take mothers aside when their daughters hit sixteen and TRAIN them to do this? Like a Masonic Rite for the menopausal? Grrrrrrrrrrr. 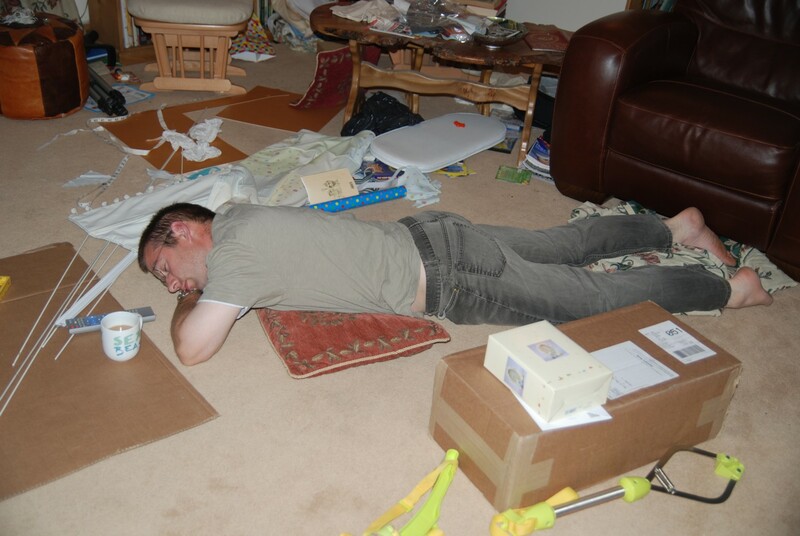 I can’t believe your husband could fall asleep amidst all of that stuff, he looks so peaceful. I would have kicked him and then pretended I hadn’t. Thanks for showing me where to start on the “a little pregnant” blog. I am new to blogging and admittedly a dork. I’m dying to hear how it went. Did the rain hold off?